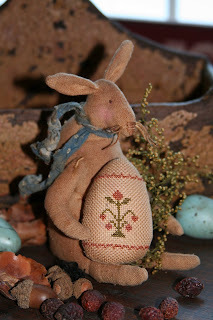 With thy Needle & Thread: Hop on Over! We have begun to upload the new Spring 2008 pattern designs onto our website. They are on the last page of the NEW ITEMS category. We are now taking advance orders for these patterns and will begin shipping in approximately a week. Keep an eye out for a FRESH NEW LOOK to our website in the real near future. We will have some new and exciting features to the site. A email newsletter will be sent out to our subscribers announcing the GRAND OPENING. The current site is up and running right along as we work on our new site, so feel free to shop online. Sign up for our email newsletter if you already haven't! Goodie, I've finally found my punch needle hero! Hi, Brenda! As you probably know if you've looked around on these blogs, the gals, "tag" each other to request you post 5 things about yourself. So, without further adieu ~ You've been TAGGED! BTW ~ GREAT new designs on the website!